Mitsuha, a high school girl living in a small town in the mountains, has a dream that she's a boy living in Tokyo. Taki, a high school boy in Tokyo, dreams he's a girl living in a quaint little mountain town. Sharing bodies, relationships, and lives, the two become inextricably interwoven--but are any connections truly inseverable in the grand tapestry of fate? Written by director MAKOTO SHINKAI during the production of the film by the same title, your name. is in turns funny, heartwarming, and heart-wrenching as it follows the struggles of two young people determined to hold on to one another. Every so often when I wake up in the morning, for some reason, I'm crying. 5つ星のうち5.0As a fan of the movie- its nice! If you're a fan of the movie like me (who bought the soundtrack, this book, and soon the Blu-Ray and the figures! ), then you're in for an absolute treat! If you're looking into giving "Your Name" a chance then this isn't for you, well not yet. You have to watch and understand the film first before you can truly appreciate what kind of beauty Mr. Shinkai had hid deep in this book. Like what happened to me. As soon as I read the book, I felt as if an invisible "force" have "pushed" me right back into the film. Emotions were everywhere. Just imagine the film as a super delicious main course, and this book as a scrumptious dessert that comes after. That's how this works. You don't go straight ahead for the dessert before enjoying the main course. This is the cream of the crop that completes the Kimi no Na Wa franchise as a whole. 5つ星のうち4.0Great buy! But only for fans of Jap LN's and of the movie. Bought as a gift, so I didn't read the whole book, but I did skim through a few chapters and the author's note. If you're unfamiliar with the style of a Japanese light novel (J LN), you might find it off-putting. In my experience, there isn't a lot of effort spent translating light novels artistically, and the result is a rather straightforward prose with too many "..." (ellipses). If you ARE a fan of J LN's, I'd still suggest only purchasing this book if you've seen the movie. The author even notes that he was reluctant to write the book because the story is much better as a movie. Still, it reads like any other J LN. If you know what you're in for (a collector's item; a reminder of a favorite movie, ect), and what you're NOT in for (beautiful prose, an introduction to the story), then this is a great conditional buy. This novel is a wonderful accompaniment to the film. There are so many small details that are hinted at in the movie that are made clear in the novel. They each have their strength. I wouldn't want to read the novel and not see the film first, personally, but they are both excellent. 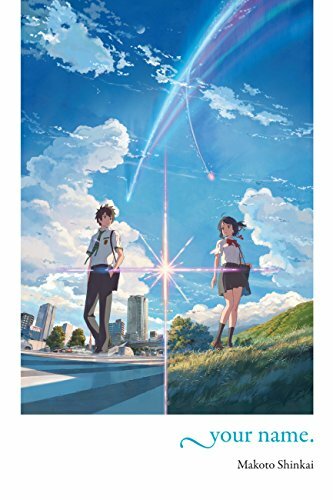 5つ星のうち5.0Your name - a story that will stick with you. Surprisingly touching... this did not feel at all like a novelization, but a full blown exploration of the author's vision. With a very Japanese feel to the characters, the story itself could have been anywhere and still been as moving. I am very eager to see the movie when it is available stateside. I highly recommend!! There really isn’t a story like it. If you’re looking for a wrench to throw in the monotony machine; then this is your “wrench.” The book is a love story that has sad moments, allowing the story to have some actually gravity to it. Also if you are familiar with Japanese anime or culture then you will also pick up on the funny parts as well. This story is not what I would call a full on tear jerker, but it will absolutely pluck some of your heart strings. I read lots of books and I can easily say that this is a refreshing book, also see the movie as well.